The Fuji X-H1 follows the same general design language as other high-end X Series cameras, but it also borrows elements from the medium format GFX and definitely looks a bit different from the X-T2, for example, when you look closer. 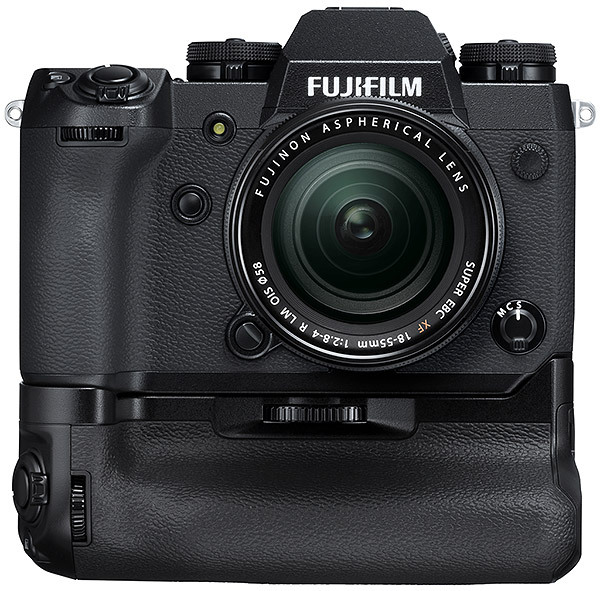 We’ll look at some of the design changes in the next section, but if you’re a fan of Fujifilm ergonomics, don’t worry, it’s still very much a Fuji camera. If you’ve ever wondered if companies listen to feedback on things such as ergonomics, Fujifilm certainly has been. 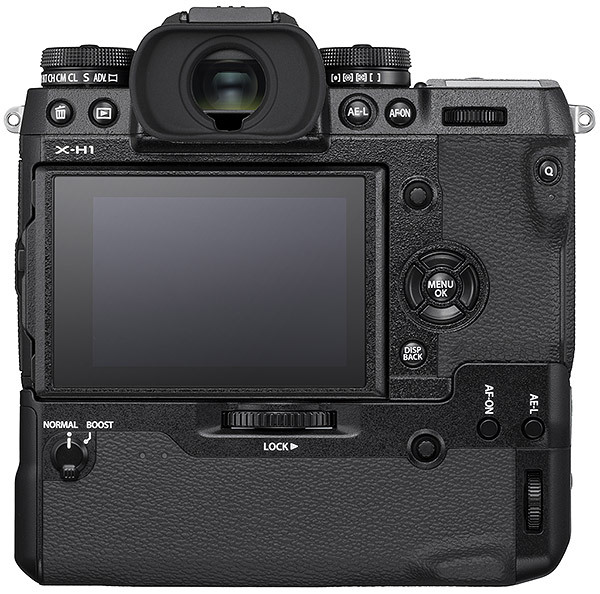 The X-H1 incorporates many improvements based on feedback from professional photographers, including a larger grip design, a redesigned leaf-spring switch for the shutter release, a quieter shutter mechanism, a new focus level, a new AF-On button — which should prove very useful for photographers preferring back-button autofocus — and larger buttons on the rear of the camera. Looking at the rear of the camera, we find a relatively sparse, no-nonsense assortment of buttons. 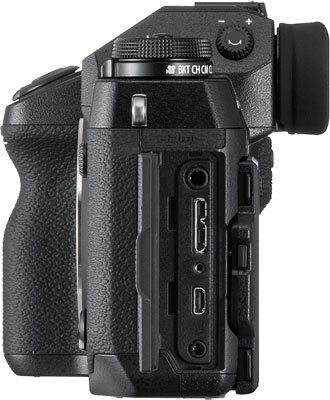 There are playback and delete buttons to the left of the viewfinder and AE-L and AF-ON buttons to the right. There’s a rear command dial, a small Q button to the right of the thumb grip, AF joystick, directional buttons and DISP/BACK button to the right of the 3-inch tilting touchscreen display. 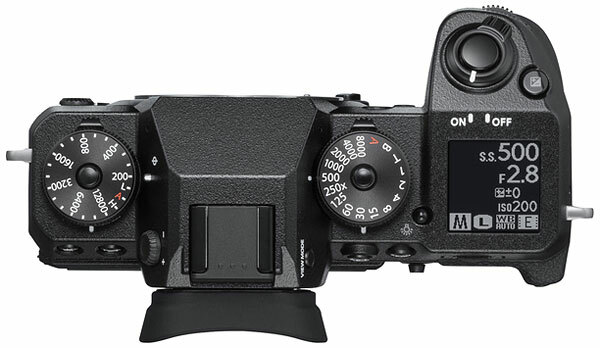 Gone is the AF-L button of the X-T2, although presumably the AF-ON button can be set to serve the same functionality, and the command dial is now all the way to the right of the rear buttons. We see the biggest differences when we look at the top deck of the X-H1. First, there’s now a top-deck status display, discussed below, and the exposure compensation dial is now gone, replaced with a dedicated button. The new grip is particularly obvious from above, as it is much larger than that found on the X-T2. The new shutter release is immediately evident as well. We are looking forward to getting our hands on the Fujifilm X-H1 later today, so stay tuned for more impressions of how the camera feels. 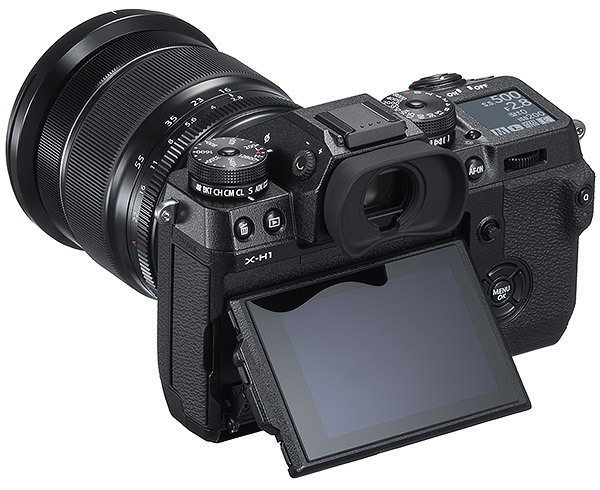 The Fuji X-H1 has an all-new OLED electronic viewfinder, which has a higher resolution than previous Fujifilm X Series EVFs. In fact, the new viewfinder has a very high dot count of 3.69 million. This is right up there with the Sony A9 in terms of dot count and even matches Fujifilm’s medium format camera, the GFX 50S. Despite being higher resolution (3.69M versus 2.36M dots), the X-H1’s EVF does however have a bit lower magnification than the X-T2 (0.75x versus 0.77x in 35mm equivalent terms). With that said, the X-H1’s electronic viewfinder remains impressive on paper. The claimed display time lag is a mere 0.005 seconds, and the viewfinder panel has a frame rate of 100fps. 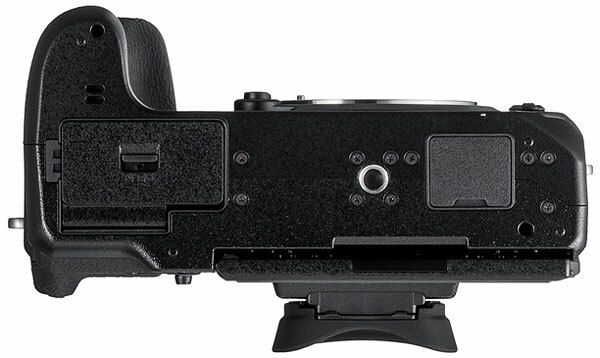 Further, the EVF offers a 100% field of view. The X-H1 includes a tilting touchscreen display. Like the X-T2, the LCD can tilt in three directions and has 1.04-million dots. 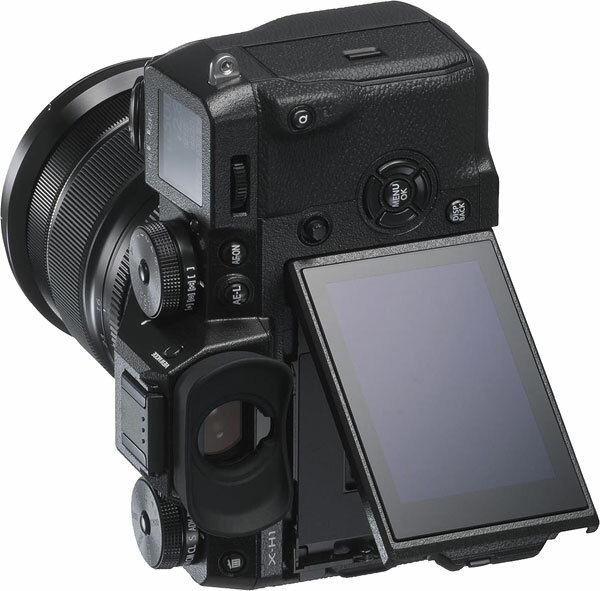 This is the same rear display as the X-T2, but what makes the X-H1 different is its new, secondary top-deck display, which Fujifilm dubs the “sub-LCD.” The 1.28-inch e-ink display is much like the one found on the GFX. It has light lettering on a dark background by default but can but this is reversed when the display is illuminated via its dedicated light-up button, presenting dark text on a light background. 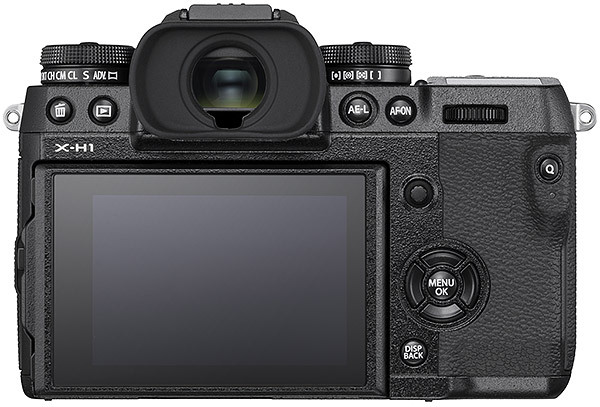 While the somewhat larger and heavier X-H1 may look generally similar to the X-T2, there are numerous changes to the body’s construction. In addition to its dust & water resistance, and ability to operate in temperatures as low as 14° F (-10° C), the X-H1 has 25% thicker magnesium alloy than the X-T2. To help keep the X-H1 looking good even after extensive use, the body is coated with a new scratch-resistant material. As mentioned, the X-H1 is the first X Series camera to include in-body image stabilization. The system works via three axial accelerometers and three gyro sensors, and includes a specially-developed dual processor that performs around 10,000 calculations per second. Fujifilm claims the 5-axis image stabilization system will deliver up to 5.5 stops of image stabilization when paired with certain XF and XC lenses, although the image stabilization system in general is compatible with all Fujinon XF and XC optics. To help further combat blurry images, the X-H1 includes a new spring mechanism to reduce tiny vibrations created by the movement of the mechanical shutter. If you want to virtually eliminate all vibrations caused by normal operation of the camera, you can utilize the new electronic front curtain shutter option or the camera’s fully electronic shutter. The imaging pipeline is familiar. Like the X-T2 and X-Pro2, the X-H1 features a 24.3-megapixel X-Trans CMOS III APS-C sensor and Fujifilm’s X-Processor Pro image processor. The native ISO range is 200 to 12,800, which can be extended as low as ISO 100 and as high as ISO 51,200. 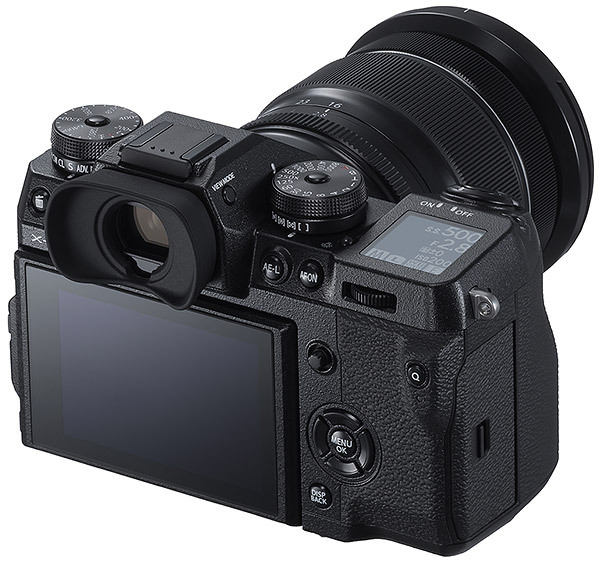 Fujifilm cameras are well-known for their Film Simulations and the X-H1 is no different in that respect, as it offers the standard suite of Film Simulations including the recently-added ACROS. However, it has a new trick up its sleeve, the new ETERNA film simulation mode. This mode is said to be ideal for movies but can be used for stills as well. The mode simulates cinematic film by producing subdued colors and rich shadow tones, which Fujifilm says allows for more flexibility during post-processing. To help ensure better images in a variety of shooting conditions, the X-H1 is the first Fujifilm camera with flicker reduction. This allows you to capture stable exposures during burst shooting under fluorescent and mercury lights. Speaking of performance, the X-H1 is quite quick. It can shoot at up to 14 frames per second with its electronic shutter and 8 frames per second when using the mechanical shutter, which are the same burst speed specs as the X-T2. The electronic shutter can shoot at up to 1/32,000s, while the mechanical shutter tops out at 1/8,000s. We will need to test the camera in our lab, of course, but Fujifilm states that you can expect a buffer depth of around 40 JPEG frames, 27 lossless compressed RAW images and 23 uncompressed RAW images when using the electronic shutter at maximum speed, and 80, 31 and 26 frames respectively when using the mechanical shutter for the same file qualities. These figures are however one to three frames lower than Fujifilm’s X-T2 buffer specs, which are 42 JPEG, 28 lossless compressed RAW and 25 uncompressed RAW frames at 14 fps, and 83 JPEG, 33 lossless compressed RAW and 27 uncompressed RAW frames at 8 fps. 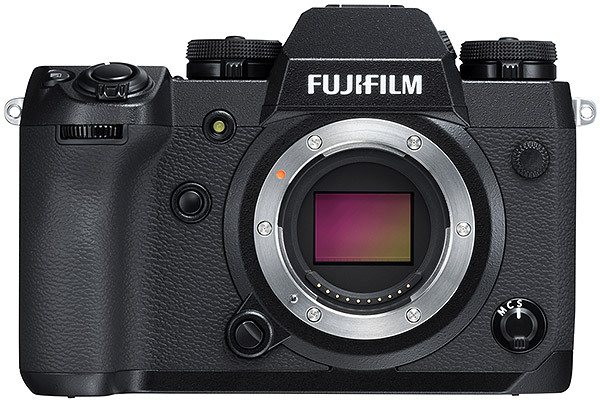 While the hybrid phase/contrast detect AF system is the same at its core as the X-T2’s, with 325 total AF points and 91 Zone Focusing areas, Fujifilm has tinkered with the system’s sensitivity and performance. The low-light limit for phase detection autofocus has been improved by about 1.5 stops, from +0.5 EV down to -1.0 EV. Further, the minimum usable aperture for lenses has gone from f/8 to f/11, meaning that you can use the Fujifilm 100-400mm lens with a 2x teleconverter and still have full autofocus on the X-H1. Fujifilm claims that major improvements have been made to the autofocus algorithms, particularly with respect to continually focusing while zooming the lens. If you add the optional Vertical Power Booster Grip (VPB-XH1), which will be available in a kit with the X-H1, it can not only increase battery life to 900 shots (and 4K video recording to 30 minutes), but also boosts continuous shooting to 11 frames per second with the mechanical shutter. (Claimed buffer depths at 11 fps are 70 JPEG, 28 lossless compressed RAW and 24 uncompressed RAW frames.) What about battery life without the grip? Well, it’s not that good. The X-H1 uses Fujifilm’s existing NP-W126S lithium-ion battery pack, and the camera’s battery life is only rated for about 310 frames on a charge. The VPB-XHI Vertical Power Booster Grip, in addition to increasing battery life considerably, has a few tricks up its sleeve. The grip is weather-resistant, like the body, and provides space for two additional NP-W126S batteries. It includes an array of buttons: shutter release, focus lever, AE-L, AF-ON, command dial, Q button and Fn buttons. It also includes a headphone socket so that sound can be monitored while recording video. Further, the grip includes a socket for direct recharging. There is also a new Wide Eyecup EC-XH W accessory. This eyecup covers a broader area around the eyepiece which blocks out additional light, and the eyecup can be rotated in 90-degree increments, allowing it to be used with either eye, and for shooting vertically or horizontally. The X-H1 is the first Fujifilm camera to offer DCI 4K (4096 x 2160) video recording, and it includes internal F-log recording, making it the most pro-oriented video camera of any X Series camera to date. Further, it offers dynamic range recording settings up to 400%, which Fujifilm states offers approximately 12 stops of dynamic range. For the highest quality video, you can record video at a maximum bit rate of 200 Mbps. Further, audio has not been ignored, the X-H1 includes a new high-quality internal microphone (24 bit/48 kHz). Looking more at the video recording options, the camera offers DCI 4K and 4K UHD (3840 x 2160) recording at up to 24 and 30 frames per second, respectively, with clip durations limited to about 15 minutes. If you want a higher frame rate, you need to reduce your recording quality to 1920 x 1080 (Full HD), which allows for 60 fps recording via normal modes and 120 fps via the special high-speed recording mode, with clip limits of about 20 and 6 minutes respectively. The high-speed mode allows for slow-motion videos with 1/2, 1/4 and 1/5 speed playback. There’s also a 2K (2048 x 1080) mode at up to 60 fps with a 20 minute limit, as well as HD (1280 x 720) at up to 60 fps with a 30 minute limit. Video file format is MOV (MPEG-4 AVC / H.264) with LPCM stereo audio. There are numerous ports on the X-H1, including a hot shoe on the top of the camera, a PC sync socket on the front, a USB 3.0 Micro-B port, a Micro (Type-D) HDMI port, a 2.5mm remote release jack, and a 3.5mm external mic jack. 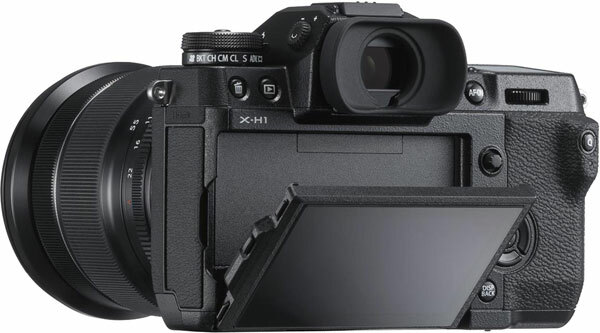 The X-H1 also has dual SD card slots, both offering UHS-II compatibility. For wireless connectivity, the X-H1 offers built-in Wi-Fi and Bluetooth. The Bluetooth is Ver 4.0 (Bluetooth Low Energy). The Fujifilm X-H1 will be available starting March 1. The camera will sell body-only for US$1,899.95 and CAD $2,449.99. Accessories included are: NP-W126S battery pack, BC-W126 battery charger, EF-X8s hoe-mount flash unit, shoulder strap, body cap, strap clip, protective cover, clip attaching tool, hot shoe cover, grip connector cover, sync terminal cover, cable protector, and an Owner’s manual. The X-H1 will also be available in a kit with the Vertical Power Booster Grip, which will sell for $2,199.95 and $2,799.99 in the US and Canada, respectively. Below are crops from our laboratory Still Life target comparing Fuji X-H1 image quality to its less expensive sibling, the X-T2, as well as against several recent premium interchangeable lens cameras: the Nikon D500, Olympus E-M1 II, Panasonic GH5 and Sony A7 III. The Sony A7 Mark III is the only full-frame model in this comparison, however we decided to include it because at the time of writing it is selling for the same price as the X-H1, and because of Fujifilm’s claim that their X-Trans APS-C sensors produce image quality that can rival full-frame Bayer-filtered sensors. NOTE: These images are from best quality JPEGs straight out of the camera, at default settings including noise reduction and using the camera’s actual base ISO (not extended ISO settings). All cameras in this comparison were shot with our very sharp reference lenses. Clicking any crop will take you to a carrier page where you can click once again to access the full resolution image as delivered straight from the camera. For those interested in working with the RAW files involved, click these links to visit each camera’s respective sample image thumbnail page: Fuji X-H1, Fuji X-T2, Nikon D500, Olympus E-M1 II, Panasonic GH5, and Sony A7 III — links to the RAW files appear beneath those for the JPEG images, wherever we have them. 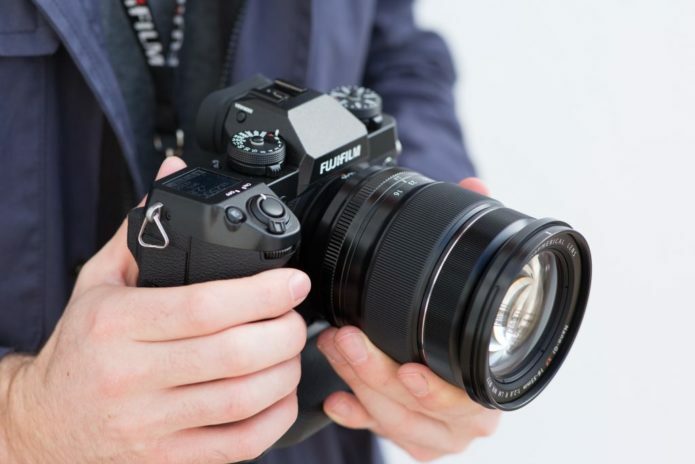 And remember, you can always go to our world-renowned Comparometer to compare the Fuji X-H1 to any camera we’ve ever tested! Above, we compare the X-H1 to its less expensive sibling, the X-T2, which shares the same sensor and processor hardware. As expected, image quality is very similar at base ISO with both cameras providing great image quality, though we do see the X-H1’s image is just a bit sharper here. This is mostly due to the lenses used, though, as we had to retire our Fujinon 60mm f/2.4 lens which is a “focus by wire” design that was no longer focusing reliably. We will probably switch to the Fujinon 56mm f/1.2 in the long term, but in the meantime the X-H1 shots above were taken with the Fujinon 90mm f/2. Still, it appears Fuji has tweaked default JPEG processing, with a revised tone curve that produces brighter upper midtones and highlights, and slightly higher saturation of greens and reds. Here we compare the Fuji X-H1 to the 20.7-megapixel APS-C Nikon D500 at base ISO. The 24-megapixel X-H1 does resolve a bit more detail than the Nikon, however the D500 produces a slightly crisper image with higher contrast which is especially noticeable in the red-leaf swatch, though sharpening halos are more evident from the Nikon around high-contrast edges. Noise levels are low from both cameras here at base ISO, however keep in mind the higher base ISO of the Fuji. Both cameras offer great color, though the Fuji’s appears a little more accurate overall. Above we compare the Bayer-filtered Micro Four Thirds Olympus E-M1 Mark II to the X-Trans-filtered APS-C X-H1. You would think the 24-megapixel X-H1 would have a noticeable resolution advantage over the 20-megapixel E-M1 II here, but both cameras have similar resolutions along the vertical axis (4000 vs 3888 pixels) which is how this scene is framed, so the resolution difference is very minor and mostly boils down to different demosaicing algorithms and processing. Luminance noise appears higher from the Fuji, but chrominance noise is higher from the Olympus. The Olympus produces a crisper image with higher contrast, though default sharpening also appears to be a bit stronger. The X-H1 actually resolves more fine detail in our red-leaf swatch even though contrast is lower, while the E-M1 II renders it smoother but with less fine detail, however the Olympus does better with thread pattern in the pink fabric. Both offer great color, but reds and greens are little more saturated from the Fuji. Here, we compare the X-H1 to another high-performance 20-megapixel Micro Four Thirds camera, the Panasonic GH5. Again, not much difference against the 24-megapixel Fuji X-T2 in terms of captured resolution due to the different aspect ratios. The GH5 image is however a little more natural-looking, with some areas such as the fabrics showing better detail, while the X-H1 image is a bit sharper and contrastier overall. The red-leaf pattern is more faithfully reproduced by the Fuji, however again that’s partially because the Panasonic is reproducing more of the fine thread pattern which breaks up the leaf pattern a bit. Colors are also just a little more accurate from the Fuji. Above we compare the 24-megapixel APS-C X-H1 to the new 24-megapixel full-frame Sony A7 III. This isn’t really a fair comparison, but the A7 III body lists for a similar price, and Fuji has claimed their X-Trans APS-C sensors offer image quality comparable to full-frame cameras. Here, the Sony produces a sharper, crisper image with better detail and lower noise, however there are noticeable moiré patterns in the red-leaf swatch. The Sony reproduces many of the offset printing colors in the mosaic crop and resolves much more of the fine thread pattern in the fabrics, but overall color is warmer and generally more pleasing from the Fuji. Again, we see slightly sharper, crisper results from the X-H1, while noise levels appear very similar. The tone curve used by the X-H1 continues to produce a brighter overall image despite both images having near identical middle-gray levels (which is how we try to expose these shots). Subtle detail in our tricky red-leaf swatch appears to be just slightly better defined from the X-T2, though. Here at ISO 1600, the Nikon’s rendering is much softer than it was at base ISO, while the X-H1’s is only slightly softer, and the Fuji continues to resolve more detail in most areas. While contrast is still much higher in the red-leaf swatch, the D500’s default noise reduction has blurred away more of the subtle detail than the X-H1. Luminance noise is however a bit higher from the X-H1, which is not unexpected thanks to its smaller pixels. The Fuji X-H1 starts to pull away from the Olympus E-M1 II here at ISO 1600, with much lower chroma noise and fewer noise reduction artifacts, though luma noise is higher and a little coarser. The Olympus E-M1 II’s default noise reduction starts to distort and flatten subtle detail in the mosaic crop and especially in the red-leaf fabric. The GH5 compares fairly well with the X-H1 here at ISO 1600, producing an image with lower noise while holding onto almost as much detail, except in our troublesome red-leaf swatch where the Fuji does much better with fine detail. Overall contrast and color continue to be better from the X-H1. Unsurprisingly, the full-frame Sony A7 III out-performs the X-H1 here at ISO 1600, with a crisper, cleaner and more detailed image overall, although moiré patterns and area/frequency-dependent noise reduction artifacts interfere with subtle detail in the red-leaf swatch. Colors are still warmer and more pleasing from the Fuji, though. Again, very similar image quality here at ISO 3200 between the two siblings, with the X-H1 continuing to provide a brighter, contrastier and slightly more saturated image. Once again, we see the Fuji X-H1 holds onto more detail than the Nikon D500 here at ISO 3200, though the D500 continues to produce higher contrast with more obvious sharpening halos. Luma noise levels are again a bit higher from the X-H1 but chroma noise is lower, and overall the X-H1 produced the better image here. The Fuji X-H1 is the overall winner here at ISO 3200, with better detail and fewer noise reduction artifacts than the Olympus E-M1 II. Luminance noise from the X-H1 does appear a little higher, but chrominance noise is lower, and the Fuji hangs on to more fine detail in most areas. Colors remain warmer and a little more pleasing from the Fuji as well. The Fuji X-H1 comes out ahead in this comparison as well. The Fuji image looks more refined and natural in areas of fine detail while the Panasonic’s area-specific noise reduction tends to distort or blur fine elements a bit more than the Fuji. Luminance noise in flatter areas is lower from the Panasonic, but noise reduction artifacts are more visible compared to the Fuji’s more film-like noise grain structure. The Fuji does significantly better with subtle detail in our red-leaf swatch, even though contrast is a little lower. The A7 III continues to produce a crisper, more contrasty and detailed image than the X-H1 here at ISO 3200. Noise levels are indeed lower from the full-frame Sony, though less natural-looking noise reduction artifacts can be seen in flatter areas. Overall, the Sony A7 III still comes out ahead here when viewed at 100% like this, but there is no denying the X-H1 does amazingly well for an APS-C camera. Detail comparison. High-contrast detail is also important, pushing the camera in different ways, so we like to look at it, too. The X-H1 performs very similar to its predecessor here, with both able to fully resolve the line pattern inside the lettering even at ISO 6400, and with the only noticeable differences being contrast and color. The X-H1 compares well to the Olympus E-M1 II and Panasonic GH5, with both Micro Four Thirds models dropping off in image quality more quickly as ISO rises. The APS-C D500 produces higher contrast across ISOs, but the Nikon isn’t able to resolve quite as much detail as the X-H1, and it generates the most obvious sharpening halos. The Sony A7 III is easily the overall winner here with great detail and contrast, and the least image degradation as sensitivity climbs, though that’s not a surprise given its full-frame sensor. Its default processing is arguably the most sophisticated as well, maintaining excellent detail, contrast and crispness while producing very few sharpening artifacts. Fuji X-H1 4K Test Video – Fujifilm 10-24mm, 3840 x 2160 (4K) at 24 fps, Eterna Film Simulation, ISO 200, DR100.